Movies: LASCO C3 (large, small mpeg, QuickTime). Caption: You could see it easily with your unaided eye (but don't try!) if only Comet Machholz 1 were not so very close to the Sun. This unusual comet, reputed to flare up a lot, is today sweltering only 22 million kilometres from the Sun. This is its closest approach on an orbit that brings it back to the solar vicinity every 63 months. The best and perhaps the only view of it at this time comes from the ESA-NASA sunwatching spacecraft SOHO. As an added bonus, Venus appears in the lower right part of the LASCO images. The comet sighting was another unique opportunity for the Ultraviolet Coronagraph Spectrometer (UVCS) to follow up. 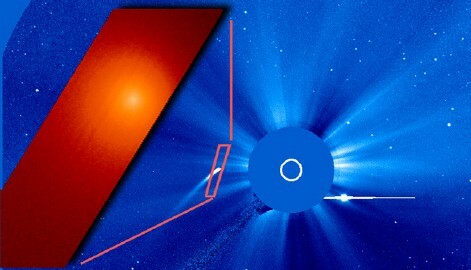 Observing through a narrow slit, the comet drifted by the field of view, enabling the reconstruction of an image, shown superimposed on a LASCO C3 image in the top panel. There is a striking difference between the appearance in the UV light of Lyman alpha versus the visible light images from LASCO. These observations can be analysed to give an estimate of the density of the impinging solar wind at the position of the comet. Enjoy the cropped movies here, and read more on the ESA science web pages. 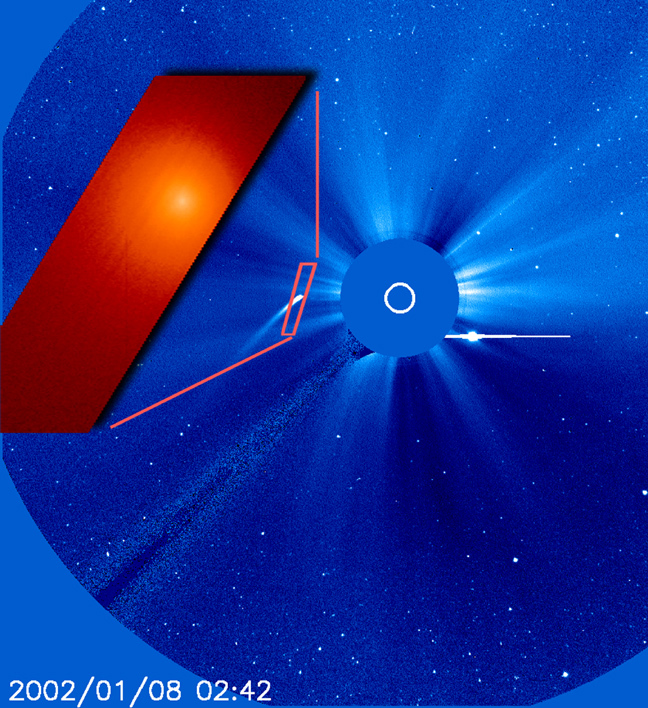 SOHO's private view of a sunbathing comet. Se "usynlig" komet på bt.no!